Vend's Sell Screen on Mac and PC – How can we help? The article below covers everything you need to know about opening and closing your store in Vend and how to make sales throughout the day. 1. Login using your existing Vend username and password. 2. Select Sell from the left-hand side menu followed by Sell again from the popout menu. Once here you will need to open your register. 3. If you have more than one register you will be asked to select which one you would like to open. If you have already accessed the Sell Screen & a register is already opened, we will automatically load that register. If you need to select a different register, you will need to reset data. Your register will now be open, ready for the day's trading. For many retailers, knowing who has processed a sale is important for reporting, commissions, and auditing. Before making a sale, check the top right-hand corner of the screen to see which user is logged in. To manually change user, click the username in the top right and choose 'Switch User'. 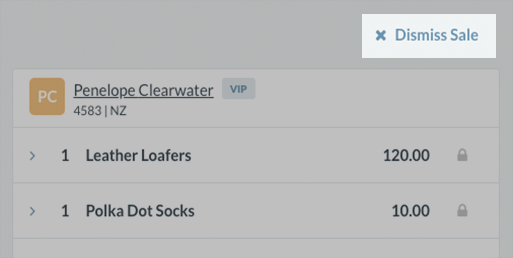 Tip: Automatically prompt for the next user: You can help to ensure you are using the correct user by turning on the Select user for next sale setting. This can be turned on or off for each register in your store. 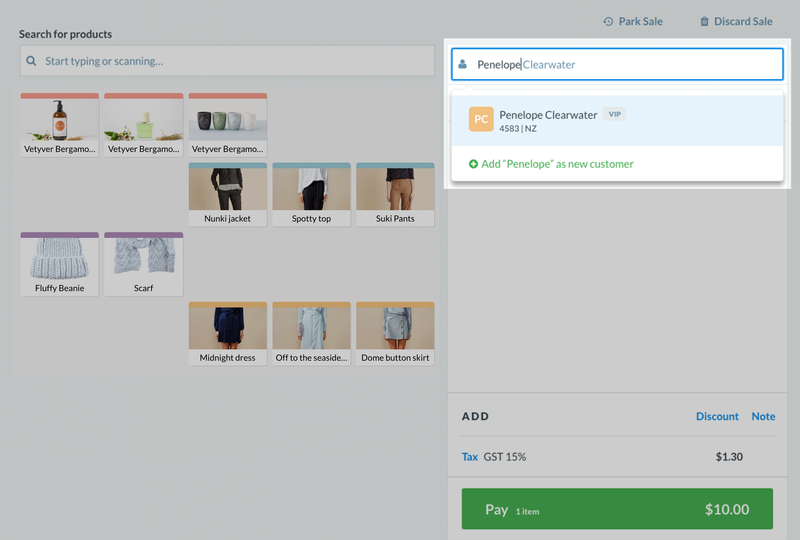 There are three ways to add products to a sale on Vend's Sell Screen; using Quick Keys, searching and using a barcode (SKU). Quick Keys can be the easiest way to add products to a sale. To add a product using a Quick Key, locate the product's Quick Key and click on it. This will immediately add the corresponding product(s) to the sale. If you have not yet set up Quick Keys but would like to find out how click here to learn more. When you scan a barcode, the item will automatically be added to the screen. You do not need to click anywhere first before bringing up a product through scanning. Important: If you have duplicate SKU's or have given two or more products the same SKU, an error message will be generated prompting you to search the product by name. To fix this from happening in the future, search for the SKU on your product page to identify and fix any duplicates. If you have made a mistake, click the 'trashcan' icon by the product name. Clicking the 'trashcan' icon will remove the product from the sale. If you wish to view further information on a product you have just added to a sale you can do this from the sell screen. Click the product name on the sale list and navigate to Show Inventory & Details. This is useful if you want to see the description of the product or certain information like the stock levels. You will be able to see the stock level in all of your outlets, making it easy to check if an item is in stock in another store. Changing the quantity of the product allows you to add more of the same item to the sale. This is best practice, so it is a good idea to get into the habit of doing it this way. This ensures that any discounts apply to ALL the items and that price books with quantity-based discounts are applied correctly. To edit the quantity, click on a product in the sale and type in the new quantity. Important: If you have disallowed cashiers from processing discounts they will be unable to apply a negative quantity to an item. 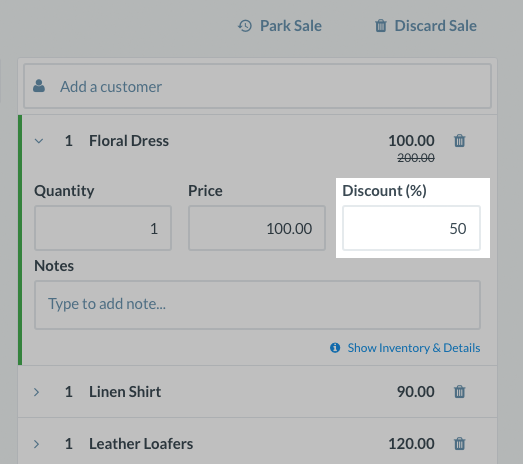 You can choose to discount a product by a percentage, or by reducing the unit price. This is called a line-item discount. Alternatively, alter the unit price from the 'price' field. When reports are run, these discounts are recorded and associated with each product. Important: Vend's tax model does NOT support manufacturer-issued coupons, which require tax to be calculated on the before-coupon-discount-applied price. Tax in Vend is calculated after the discount is applied. If you apply a percentage discount, the discount will apply to all current and future line items in the sale. If you apply a dollar amount discount, then the discount total will remain the same even after you add new products. On the Sell Screen, notes can be added to individual products as well as the entire sale. 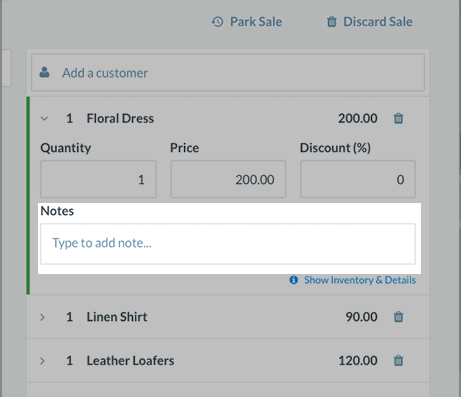 To add a sale note, input your text into the sale note field. 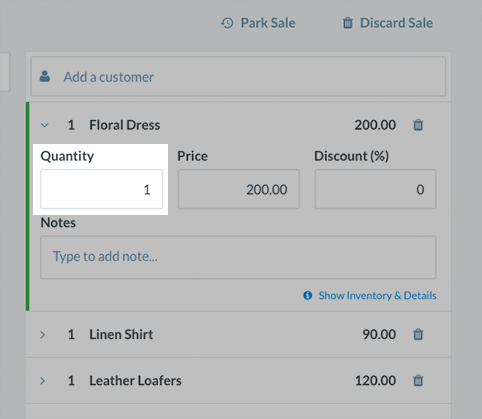 To add a line item note, click on a product in the sale and fill out the note field below. Parked sales can be super useful when customers need you to hold their purchase while they get more items or fetch their wallet, for example. They enable you to clear the sale from your Sell Screen to keep trading and retrieve it when the customer returns to the store. 1. Ring up the sale as normal. 2. Choose Park Sale from the top right. When a customer's sale is parked today, and the customer comes in tomorrow to receive and pay for their items. The purchase and the payment will both be included in tomorrow’s Register closure. 1. Add the products you want to sell to the Sell Screen. 2. Navigate to the bottom of the screen and click on Tax. This will display a list of all taxes in the sale and the value of each of these taxes. 3. Click on the 'trashcan' icon against any of the taxes you wish to remove and complete the sale when you are done. Important: Once you have removed the tax from a sale you will not be able to add it back to the sale. Sometimes, a customer may change their mind mid-way through the sale. In this case, you need to cancel the sale or start over. If you have not yet taken payment, click the Dismiss Sale button at the top of the payment box to clear it out. If you've already taken a payment, you will need to complete the sale and issue return using the standard return function. If you have accidentally continued the wrong layby, or on account sale, you can use the Dismiss Sale button to exit. The sale will not be deleted, and you can go back to it at any time. 2. A drop-down matching the customer's name will appear. You can keep typing more letters until the results are filtered enough to find your customer. 3. If your customer is not found, you can add the customer without leaving the sell screen. Just hit 'Add [X] as new customer', and Vend will open a window for you so you can add the customer's details. To learn more about creating new customers and managing existing customers in Vend for Mac or PC, click this article here. Once you have added all your items, you are ready to take payment for the sale. Click the Pay button. You will be taken to the payment screen where you will find a variety of payment type buttons (determined by what the store owner has chosen). If the customer is paying cash, you can type in the cash amount tendered. Vend will tell you how much change you need to issue. You can take multiple payments types on the same sale. 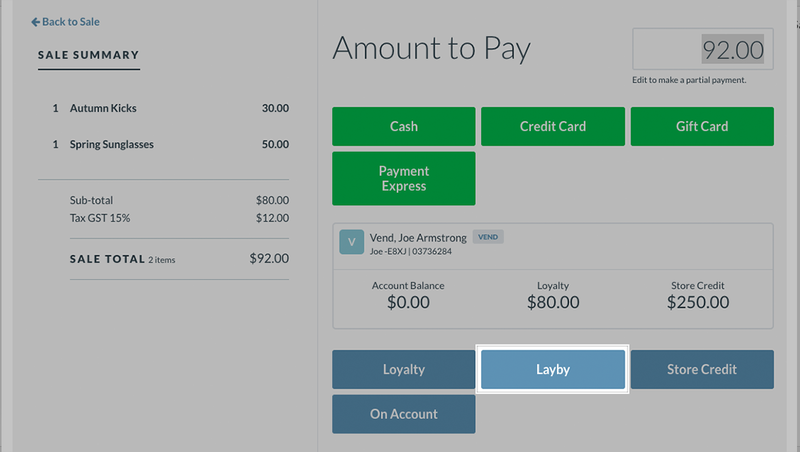 To do this, type the amount the customer wants to pay and choose the payment button. Once it is processed, the remaining balance of the sale will be adjusted, and you will be able to apply the next payment type. When taking multiple payments, the different payments will be reflected back on the Sell Screen when you click Payments. If the customer is paying by Credit Card, you will be able to complete the sale by selecting an integrated payment type. For more information on payment types available with Vend click here. If you have not yet set up your payment terminal, find your terminal here to learn how. Add the items to the sale, and click the Pay button. A payment window will appear, which will prompt you to swipe the customer's card in the terminal. Follow the prompts that appear on the payment terminal screen. 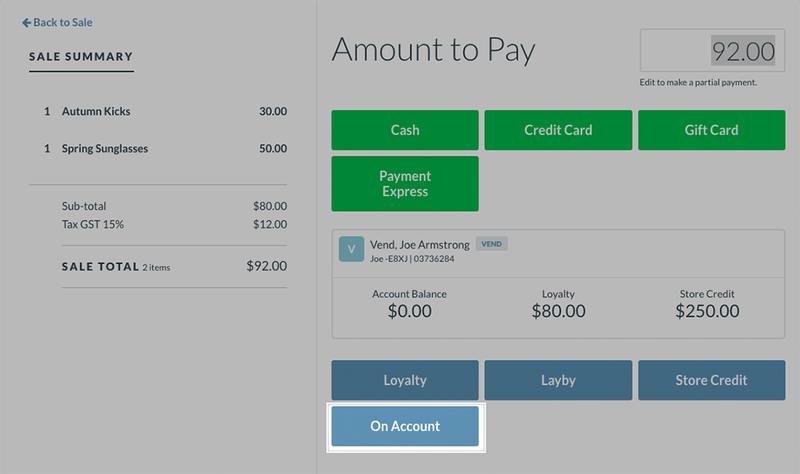 Your customer can then tap, swipe, or insert their card to complete payment. If the customer chooses to sign for their payment, a receipt will be printed for them to sign, and you will need to confirm the signature is correct. Vend will show you whether the transaction is accepted or declined. Vend will then print a copy of the receipt for you and your customer. If you have gift cards enabled for your store, and the customer wishes to make a purchase using a gift card, you can process the sale by clicking Pay and selecting the Gift Card payment type. For more information on Gift Cards and how this redemption process works, check out this article here. If you have not setup Loyalty in your store, click here to learn how. Customers can pay with Loyalty if you have Loyalty enabled in your store. To process a payment using Loyalty, add products to the sell screen and add the customer who wants to redeem their Loyalty. Tip: If you want to check the Loyalty balance of this customer before processing the sale, search for the existing customer and click on their name. 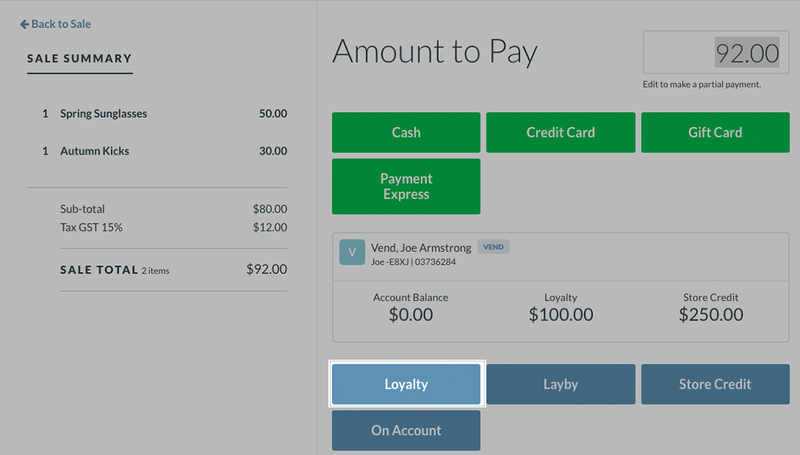 The customer should now appear in the Checkout section, click on their name to view their Loyalty balance. Next, click Pay. You can use Loyalty to pay for the sale in full or use it as a partial payment. To pay for the sale in full, click the Loyalty button below. To pay for some of the sale using Loyalty, adjust the amount tendered to the amount of Loyalty the customer wishes to redeem, click the Loyalty button below and pay off the rest using cash or card payments. If the customer is new, you can add them to your customer database and enable Loyalty for them right from the Sell Screen. Just click Create New Customer, and Vend will open a window for you so you can add the customer's details and tick loyalty on or off. Your customer will now be all set up to earn loyalty! If a customer has Store Credit, they can redeem this Store Credit to pay for part or all of a sale. To learn more about how to set up Store Credits and to use it as a method of payment, click the link here. Depending on your store settings, once the sale is completed, you will be prompted to provide the customer with a receipt. This may be either a printed or emailed receipt. You also have the option of printing a Gift Receipt for your customer if they wish to purchase something as a gift. 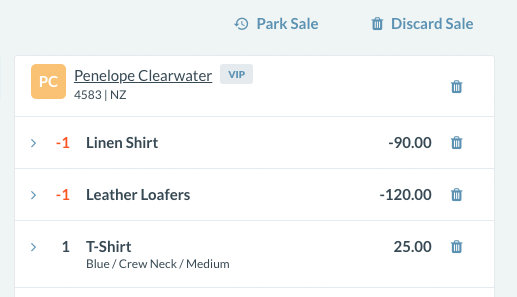 If the current register you are using is set up to print receipts, they will automatically be printed after taking payment and hitting the Complete Sale button. You can also print off a copy of the receipt before completing the sale, by clicking Print Receipt. Printing turned off, or receipt failed to print? If your store does not have receipt printing turned on, receipts will not print automatically after hitting Complete Sale. You can still print a receipt manually from the sale confirmation screen. 2. Select the All Sales tab at the top. 3. Locate the sale you wish to print the receipt for. 4. Click on the sale to expand the sale information. 5. Once here, you'll see an expanded view of the sale. On the right of this expanded view is a Print Receipt button. Clicking this button will bring up the print preview screen from where you can print out your receipt. The receipt will automatically be sent out upon completion of the sale. If you do not wish to email a receipt to a customer, you can remove their email from the Sale Confirmation screen before hitting the Complete Sale button. 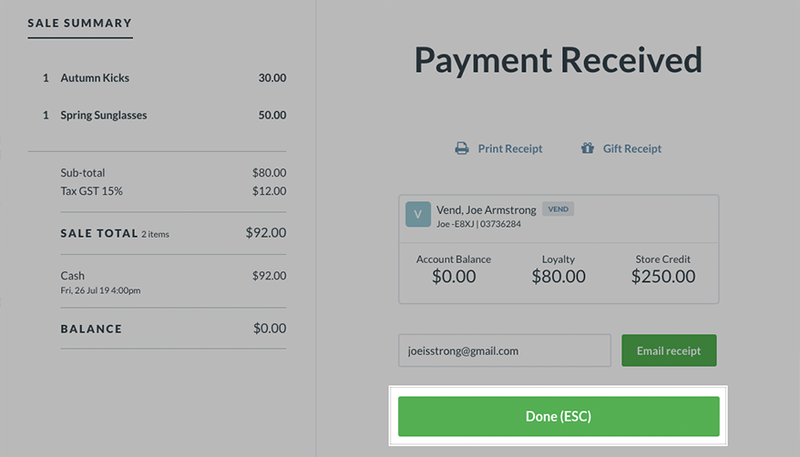 You can still email a receipt to a customer, even if it is turned off by default. 5. Once here, you'll see an expanded view of the sale. On the right of this expanded view is aEmail Receipt button. 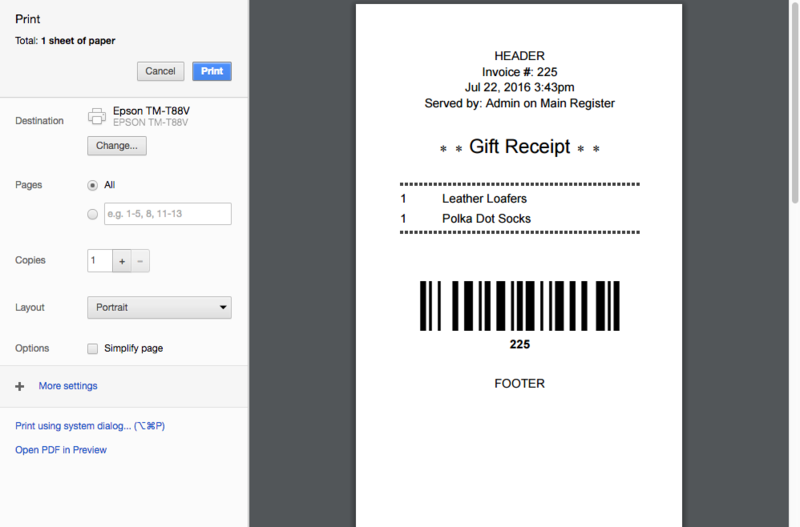 You can also print off a Gift Receipt if your customer is purchasing your products as a gift for someone else. The Gift Receipt is a simplified version of the standard receipt that does not include any payment or loyalty information. 1. Add products and click pay as normal. 2. After taking payment for the sale, you will be taken the Payment Complete page. 3. Before clicking Done, select the Gift Receipt button. 4. This will take you to the print preview screen where you can print the Gift Receipt. Note: Gift Receipts are not customisable. 5. After you've printed the Gift Receipt, click Done to complete the sale and print off a standard customer receipt. 5. Once here, you'll see an expanded view of the sale. On the right of this expanded view is a Gift Receipt button. Clicking this button will bring up the print preview screen from where you can print out your receipt. Before you begin, it is important to note that you may only complete a return on fully paid sales (including fully paid On Account and Layby sales) and not on open On Account or Layby sales OR existing return transactions. 1. Navigate to the Sales History tab and find the sale you would like to return. Tip: Click on the Process Returns tab then search for the receipt number of the sale. 2. Once the sale is located, click the Reverse Arrow to begin the return. Important: If you have disallowed cashiers from processing discounts in your store, they will also be unable to process returns. If a cashier user is unable to process returns in your store this Reverse Arrow will be greyed out and unclickable. If a customer is not attached to the original sale, you will be asked to add a customer to the return here. You can skip this if you do not wish to add a customer to this return. This sale will now appear in the Checkout section of your sale screen. The item(s) involved in this sale will now be listed as a negative value, indicating that they will be returned. Note: Return items cannot have their price adjusted. At this stage in the process, you may need to remove any products that the customer is not returning. 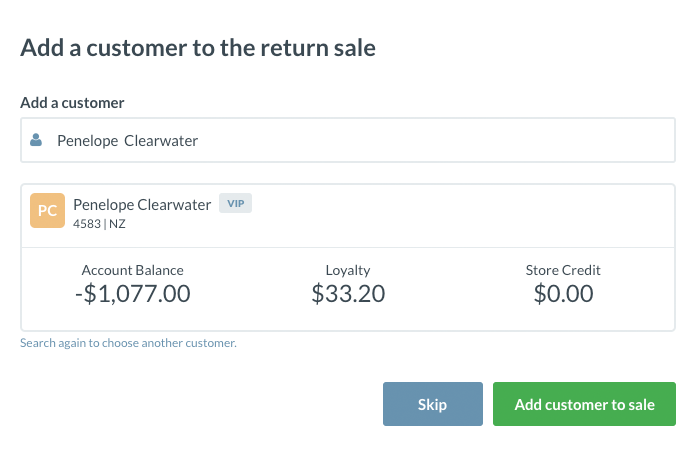 To do this click on the 'trashcan' icon next to any items your customer is not returning. Once you are happy with how everything looks, click the Refund button and select the payment type you wish to process the return with. Important: If you are returning a Worldpay, Tyro or iZettle sale, please make sure you choose the right payment type and follow the instructions on Vend and your payment terminal screen. Does your customer wants to exchange their item for something else? Each account sale is a separate invoice the customer will need to pay. If you'd like to add a sale to an existing invoice, you'll need to find and open this On Account sale again. Do not do this if your store uses the Xero integration. Xero customers: Account sales will create an accounts receivable invoice in Xero. You can read more about account sales and Xero here.. 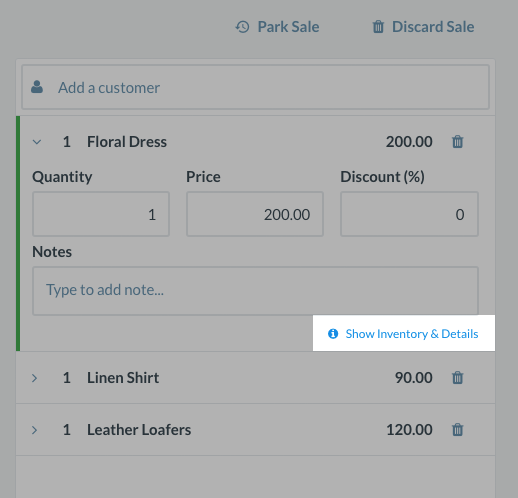 Opening an On Account sale: To open an On Account sale, tap the Menu button on the top left-hand side of the screen and click on Sales History. 1. Find the On Account Sale and click on it. 2. Choose the Open Sale button. The sale will then open on your Sell Screen. Once a sale is placed on Layby it cannot be switched to On Account, the same applies when switching from On Account to Laybys. Type in deposit amount and choose the payment type. Click Layby to put the remaining balance on a layby sale. Once you have completed all your sales for the day, you will need to close the register for your store. 1. Complete your card processing terminal's end of day process to get the sum of takings for that day. 2. Select Open/Close from the side menu. 3. This will take you to the register closure screen. In here, you will need to enter the day's counted cash (including your float) against the expected cash in your cash drawer. 4. Next, confirm the rest of the day's payments (such as credit card payments) below. 5. Confirm these amounts and add an optional register closure note if you like. You may now review your expected and counted totals for today's payments and view a breakdown of all of the day's cash movements. Once you have closed your register, you will have the option to print out this register closure's summary. You may choose to print this summary out if you want to keep a physical record of your closures, benchmark store performance between outlets or to include a print out on your end of day cash bag. The register closure summary will include the current user, outlet name, register name, closure number and the opening and closing times of the register. 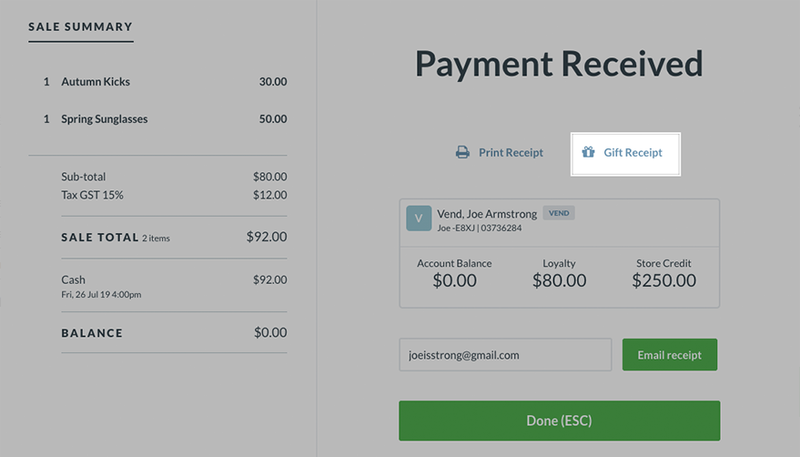 For each payment type, it will show the payment type name as well as the expected and counted amounts for each payment type. The summary will also include a register closure note if you chose to include one when closing the register and cash movements if you have Vend's cash management enabled. Important: If you open your register you will not be able to print your last summary. Only when the register is closed, will you be able to print out the last summary.